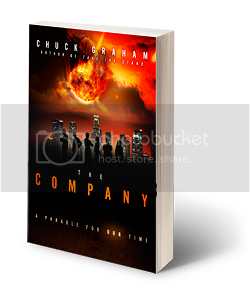 When I saw the book The Company by Chuck Graham, I knew I wanted in on this book tour. This is the kind of book I tend to read, but not the kind of book I tend to get an opportunity to review. A meteor strike plunges the world into darkness. A stranger to the village of Brigos Glen restores power and light, supplied by three businesses, known as “The Company,” located beyond the forbidden mountains. The stranger reveals a plan so the Brigons can maintain the power and share the light with outlying territories, which remain shrouded in darkness. Now, seventy years later, The Company summons six Brigons, including the young engineer Sam Mitchell, to attend a conference in the mountains of the forbidden Outlands. Responsible for compiling a report about Brigos Glen from his five companions, Sam learns how managers and villagers largely ignored the plan or compromised it to self-interest, forsaking their duty to share the light. They also took for granted The Company responsible for generating and transmitting the power. In an ordeal fraught with failure, revelations, and judgment, Sam discovers the true identity behind The Company and learns the fate that may befall Brigos Glen . . . that is, unless he can stop it. A fairly quick read, which I also tend to appreciate, this Nook book was only 179 pages, plus some appendices. I really enjoyed the storyline. Parts were fairly predictable, but not in a bad way. Sometimes it is nice when you are able to sense what is about to happen and then watch how the characters react. There were also a fair number of twists and surprises. This is a hard one to write much about, though, without giving away too much. I found the main character (Sam) to be very believable, and many of the other main characters were nicely fleshed out as well. Since the story is told from Sam's point of view, the characters who stay fairly flat and one-dimensional are the ones he doesn't get to know. This story did keep me turning the pages, and it did get me thinking besides. A great combination. Disclaimer: I received this ebook through LitFuse Blog Tour. No other compensation was received. All opinions expressed in this review are my own.